Tiger Bill Reviews Brains Lessons Shredding Repis on the gnar gnar rad from Alfred Publishing. 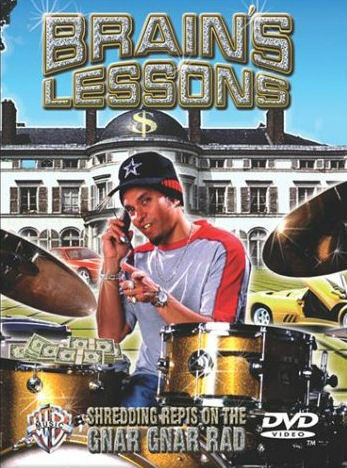 Brain's Lessons is an instructional video from Alfred Publishing, which stars drummer Bryan "Brain" Mantia. Brain has worked with Limbomaniacs, Tom Waits, Primus, and recently Guns N' Roses, among others. His educational video is divided into four main sections. Also included is a 14-page booklet that contains written examples of all lesson material. Intrigued by the subtitle, I decided to dissect Brain's Lessons and see if there's anything worthwhile inside. Here's the result. The video itself opens up with Brain jammin' on some Go-Go patterns that incorporate cookin' Conga fill-ins played with his left hand. The lesson itself consists of Brain demonstrating these Go-Go grooves. He begins with a basic pattern and builds up to more complicated (and funkier) grooves by adding more advanced right stick hi-hat and kick drum rhythms. Brain also gives us an example of his Conga drum fill-in technique, which should give you plenty of ideas to play around with. Here Brain explains the basic sticking technique that he uses. This consists of applying various levels for playing accented and unaccented notes. Included is a quick explanation of the Double Stroke Roll. Brain opens this section with a sort of duet between Drum Set Funk Beats and burps. It's not a misprint, I said burps. Brain seems to have had a good time making this video. Whether the viewer will have as much fun, depends largely on the viewer. This section gets better when it gets down to business, including demonstrations on how to get three different tones out of your Snare Drum and three ways to play your Hi-Hat. Also good is Brain's advice on how sometimes playing less (leaving some space for the other musicians) is better than overplaying. For those of you unfamiliar with the term, an Ostinato is a pattern that is constantly repeated. This section of the video gives you Brain's take on the Ostinato. He uses 2 basic foot patterns for the Ostinato part, using basic Samba and Baiao beats, and adds various left stick Snare and right stick Cymbal parts to the mix. This is great stuff for your 4-way coordination and should provide you with plenty of ideas for developing drum solos using Ostinato patterns. Bottom Line: Is Brain Worth the Bucks? I had mixed emotions about this video. I'm not much for the handheld camcorder-filmed look (Ala COPS), or blurry out of focus attempts at "creative" camera work, both of which you'll find throughout this video. I also wasn't fond of listening to Brain's explanations while he chomped on his steak dinner, ice cream, and banana. You may find these bits entertaining but I didn't. However, my bottom line for any review concerns cost versus educational value. Does this DVD, which retails for $24.95, give you your money's worth? For the beginning drummer, my answer is yes. There's enough here to get the beginner thinking along some creative lines. I would also recommend it to the more advanced drummer who is new to Funk drumming and Ostinato patterns, and has an interest in playing Go-Go. Fans of Brain won't want to miss this DVD either. For those of you who do pick up Brain's Lessons, don't miss his solo at the very end of the video. He plays part of it with some very unique drumsticks. Now this is creative, funny, and entertaining  and the camera work actually stays still long enough for you to enjoy it!